The Notwist started out as a grunge/metal influenced group near Munich in 1989, and have moved through various sonic identities since then. By their fifth album Shrink in 1998, Neon Golden’s predecessor, they were exploring strange territory between jazz and electronic music, far removed from their early beginnings. Neon Golden itself is a synthesis of low-key, understated indie-pop songwriting and carefully detailed and layered electronic production. This Room, Pilot and, especially, One With The Freaks offer genuinely catchy pop thrills, whilst the title track, closer Consequence, and opener One Step Inside Doesn’t Mean You Understand are much more minimal and metronomically languid, understated to the point of almost feeling abstract. Singer Markus Acher’s voice is something of an acquired taste – he sings in a presumably deliberately flat manner, the remove of singing in a non-native language, which I often find fascinating, adding to an emotional distance which becomes strangely affecting, words as signifiers of emotion rather than delivery as signified. It would be easy to see Neon Golden as a post-Kid A record, if it wasn’t for the fact that Shrink had mined electronic influences and textures even more fully two years before Radiohead’s giant curate’s egg. It would also be easy to see it as part of some kind of almost-scene of music that looked to bridge the gap between traditional indie rock and what one might call, in a moment of weakness, laptronica or IDM or electronica or whatever. I feel like Neon Golden, which I didn’t like initially back in 2002 but which has grown on me massively over the years, has more of a kinship with the electronic side of things than the indie side. Because The Notwist weren’t just sprinkling electronic fairy dust over indie pop songs here, they seemed to be actively integrating different compositional techniques – looping, layering, repetition – that are common in electronic and other ‘experimental’ musics, rather than more traditional songwriting. Tellingly, predecessor Shrink is even less based around songs, with several long, predominantly instrumental tracks that owe a debt to jazz and krautrock. Neon Golden is also, to my untrained ears, mixed much more like an electronic record than a rock record; Kid A, for instance, feels much more like a rock record in terms of physical sonics and dynamics to me, whereas Neon Golden’s sound design feels much more genuinely akin to purebred electronic music. In the wrong context I fear Neon Golden could sound very much of its time, the glitches and bleeps that make up much of the sound palette seeming like trendy affectations, but to me it’s the genuine article, a rich and rewarding record that grows in stature with every passing year. 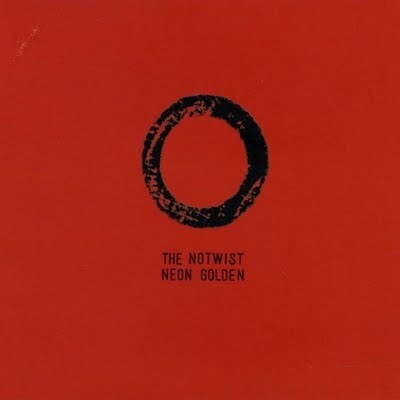 Tom Listened: I’ve owned Neon Golden for about a year now and have listened to it a handful of times but can not claim to have got to know it well enough to make a definitive judgement on its quality. In a similar way to The Wrens, this is a noughties indie album that is mightily revered but which I came to late and have never really clicked with – maybe it’s the flat vocals that remove any sense of emotion from the songs, maybe it’s the seemingly adolescent sound of the album…That said, I enjoyed the listen at record club much more than on any previous occasion and I can well imagine that this could be one of those albums that years from now I’ll listen to and think ‘how could I have ever missed its genius at first?’. Rob listened: Nick played a track from ‘Neon Golden’ at a previous meeting and I recall thinking it sounded great, with the sweet sparkle of indie pop lashed to the propulsive drive of Stereolab. Some months later, whilst digitizing my CDs I came across a 10 year old CDR with ‘Tony’s album’ scrawled across its back. I was delighted when my laptop IDed it as ‘Neon Golden’ then slightly disappointed when I played it. Flat electronoodles. Happily this evening’s playback came over much better. I have no problem with deadpan vocals and in many other ways this is an album precision tooled to get under my skin. The tunes and the momentum started to assert themselves this time around, certainly enough for ‘Neon Golden’ to begin to glide back towards the top of my listen again list. Graham Listened: Knowing nothing of their “journey” as it were, I could only go on what I heard on the night. Have to say it was great. Had that sound of a band not trying too hard and concentrating on just just getting it “right” on the record. Magnificent and understated at the same time, I may just buy it!